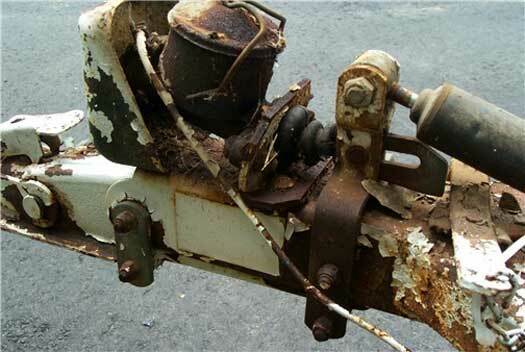 The “Ratcheting Device” is actually the parking brake. 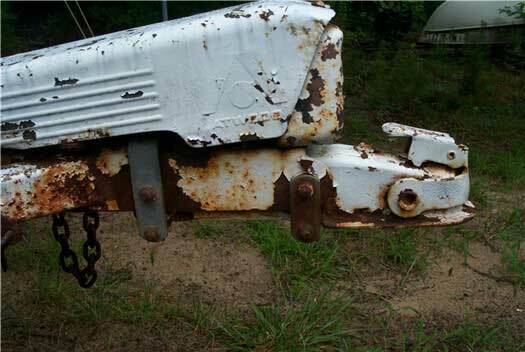 When you pull it toward the front of the hitch (see picture1), it engages the master cylinder the same as when you stop and the hitch moves forward. It should be all the way back when moving. It also has a chain on the end of that lever which is actually an emergency brake (when hooked to the ball or the towing vehicle, and the camper jumps off the ball, it will pull on the brake). I learned all of that from folks at the different Rally’s. After sitting for all those years, I drained/replaced the fluid and it actually worked semi-OK. After talking to someone far more mechanically inclined, they believe that if I replace the master cylinder, it will work great (no leaks in the line and brakes work). It is on the “to do” list. Maybe by the next rally!!! stops the "surge" forward of the trailer against the master cylinder activates the master cylinder's hydraulics and the brakes are applied. Pretty basic, so to rebuild them probably only requires a trip to NAPA for the rebuild kit or another master cylinder. Big note on these brakes tough. They have a lever/mechanical switch that deactivates the system and it should be located at the unit seating on the tongue. This lever needs to be flipped when baking up or maneauvering the trailer. Everytime you go in reverse you will create a "surge" and the brakes will apply preventing you from going in reverse. IMHO, pretty slick, simple basic system.